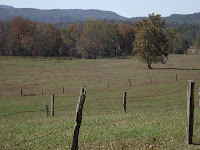 My trip to Cades Cove in the Great Smoky Mountains National Park was a surprise. My family had hoped to see a brilliant display of fall color. Instead, the hues are subdued this year. There are a few red and yellow trees but these are mixed in with the more prevalent greens and tans that still blanket the landscape. Even though we were hoping for a different mix of fall colors we still enjoyed the day. Is there ever a bad time to visit Cades Cove? I don't think so. Although granted, the pesky traffic issue on peak weekends can be challenging at times. We had plenty to see to keep us occupied today. There were several deer grazing in the fields. The herds were found in a least three different spots. 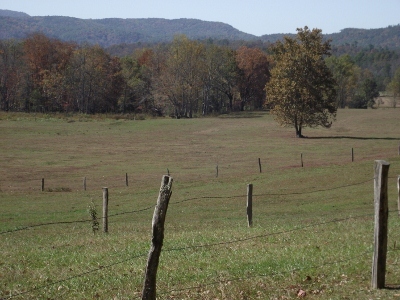 Wild turkeys were seen in one of the fields. Then nature served its most tantalizing dish. The animal we all hoped to see was spotted around a corner. Off to the right a black bear calmly munched on his dinner. 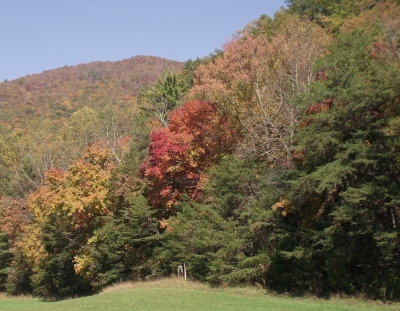 These photos of fall colors in Cades Cove tell the story better than I can. I'll let them speak for themselves.